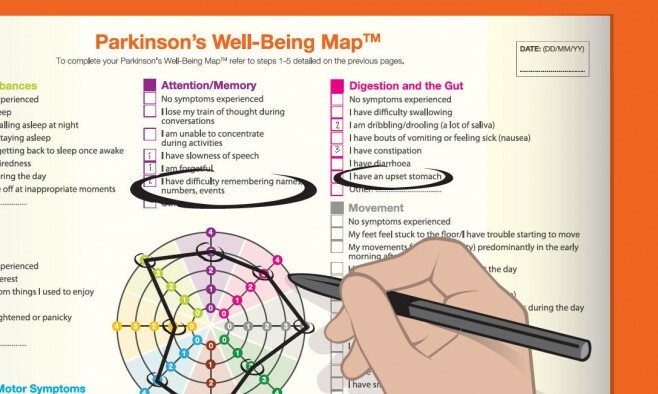 The Parkinson’s Well-Being Map is an online tool that allows you to record and review your Parkinson’s symptoms – covering all aspects of living with the condition – helping you prepare for health consultations. Simple multiple-choice questions measure the frequency and severity of your symptoms in a colourful chart. Once completed, the map clearly highlights which symptoms are of most concern, so that you can get the most out of your next health consultation. The map is available in a number of languages and you can fill in the chart online, or download for free and have your own printed version. When you have completed it, you can take a copy of the map with you to your next consultation with a healthcare professional, which will help them better assess your condition.